As graphics-related industries shift more and more to digital methods, printed materials have an increasing reliance on numerical control of the quality that’s both faster and easier than the human eye’s visual evaluation. However, since the final materials are intended to be seen by the human eye, what’s needed are measurement results that closely resemble the results of visual evaluation. But there’s a potential problem. the final viewed color is influenced by the paper on which materials are printed. That’s because fluorescent whitening agents (FWAs) are used on many kinds of paper used for printing which make the paper appear brighter. When viewed under Illuminant D50*1, the effect of the paper’s fluorescence on the color of printed materials is particularly large. For this reason, ISO 13655-2009*2 defined Measurement Condition M1 as having illumination corresponding to CIE Illuminant D50, which minimizes differences in measurement results due to paper fluorescence, an effect that was difficult to measure with conventional handheld spectrodensitometers. Utilizing Konica Minolta’s original VFS (Virtual Fluorescence Standard) technology in the FD-7 spectrodensitometer offers a unique solution to this problem by enabling color evaluation while taking into consideration the fluorescence of the paper under Illuminant D50, the standard light source for color evaluation used by the printing industry. These are the first instruments to provide measurement results that correspond to ISO 13655 Measurement Condition M1. *1 An artificial light source, commonly used for color measurement, is defined by the CIE having a spectral distribution simulating daylight. Scan measurements can be performed. Even when the instrument is connected to a PC, manual scan measurements can be performed. With optional software basICColor catch all, the density values, colorimetric values, and spectral reflectance values of various test charts (MediaWedge ECI2002, IT8.7/3, etc.) can be measured in a single operation. 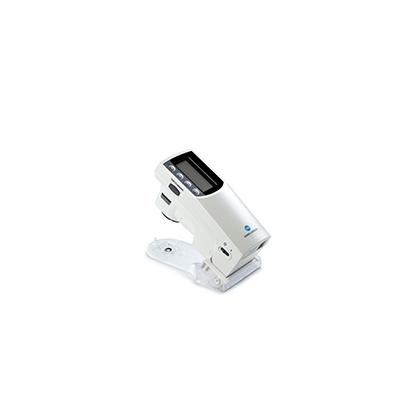 It makes the FD-7 ideal for research and development applications since both spectral reflectance data (380 to 730nm) under various light sources and spectral irradiance data (360 to 730 nm) of environmental lighting can be measured and output to a computer. Measure the illuminance and color temperature in a color viewing cabinet or the actual ambient light under which printed materials will be evaluated. Calculate colorimetric values under the measured light source (which more closely correspond to on-site visual evaluation). This eliminates time and labor lost resolving customer complaints and ensures customers receive the colors they want. The first M1 type in the world. Konica Minolta’s original technology, VFS (Virtual Fluorescence Standard) enables L*a*b* measurements corresponding to ISO 13655 Measurement Condition M1 (CIE Illuminant D50). In addition, color measurements can also be taken corresponding to ISO 13655 Measurement Conditions M0 (CIE Illuminant A) and M2 (illumination with UV-cut filter). No additional work required for wavelength compensation which is performed during white calibration. Until now, wavelength compensation could only be carried out as one part of manufacturer servicing, but now whenever white calibration is done, this task is performed, which helps to maintain the high reliability of measurement values in between periodic servicing. Now visual evaluation corresponds more closely with color measurements. Measuring materials printed on substrates containing fluorescent whitening agents (FWA), large differences between the results of measurements and visual evaluation may occur when using conventional instruments. With the new FD-7/FD-5, measurement results and visual evaluation results correspond more closely, and that includes the effects of any FWA contained in the paper. Anyone can take measurements very easily, thanks to instructions in the LCD screen guide operation. The main body weighs only about 350g, and it’s only about 430g even with the target mask attached, lighter than any spectrodensitometer previously available. Efficiency is improved when taking measurements over a long time the load is reduced on the user’s arm during work. Rapid support provided by worldwide service centers when needed. Customize the screen easily with data list view, 3D graph, pass/fail screen, etc. Scanning measurements*2 Scanning measurement of a color chart can be performed. ∗1 Illumination for wavelengths under 400nm is unidirectional. ∗2 Available when using PC software.